The truth is dozens of review copies were distributed to various scholars, writers and publications. Professor Hooks did not receive a review copy, but many others did, and there were reviews. Professor Hooks should know – he quotes (on multiple occasions) in his essay from two very prominent ones: H. R. Woudhuysen’s review in the TLS following the release of the first edition in 2014, and Michael Dirda’s review in the Washington Post of the second edition in the fall of 2015. Such a statement was never made to us. One might reasonably ask how Grace Ioppolo formulated it at all, when only a small handful of digital scans were shared (emailed at Dr. Beal’s request to show some of the variety in the annotator’s handwriting). Any scholar familiar with our Alvearie or our arguments would never suggest that “the notes” in our book represented “a 17th c. reader working from Folio or quarto texts of Shakespeare’s plays.” Furthermore, and both Grace Ioppolo and Professor Hooks fail to note this, if you did discover an annotated dictionary where a 17th c. reader was working from Folio or quarto texts from Shakespeare’s plays you would have an extraordinary book, not “very typical” in any respect! Anyone who reads through Professor Hooks’ critical assessment of Shakespeare’s Beehive will see clearly that he does not agree with Grace Ioppolo, at least on this critical point. Professor Hooks states he believes our annotator is an “active reader” but does not mention anywhere that this reader is in any way working off a Shakespeare text. Yet he cites Ioppolo without further question, seeing it as parcel of the “generous and congenial” responses we received (and, in this case, apparently did not pay attention to). Professor Hooks was not the first to provide this Ioppolo citation. To our surprise, Woudhuysen’s TLS review was largely cobbled together from a flurry of early comments made over social media, including those made by Ioppolo. When more than one prominent scholar suggested to us that we write a letter to the TLS in response to Woudhuysen, we did just that. Other than a correction the following week to one of our names (the print version read “David Wechsler”) and the title of our book, the TLS elected not to publish our letter that addressed Ioppolo’s tweets. In November 2015, over one year after her initial posting, Grace Ioppolo responded again to an article concerning the Beehive. She sent out a Tweet that began: “my husband Peter Beal & I examined this book a few years ago…” This was later deleted from her account, probably because she knows that she and her husband never once examined our copy of Baret’s Alvearie. While we did not communicate directly with Grace Ioppolo, we did engage with other scholars, and are grateful for the range of advice we received. The process began in May 2010, when we first shared our work, two years after acquiring the book. We have communicated directly with an array of important Shakespeare scholars and handwriting experts in the years since then, and have always protected the privacy of each and every one of the individuals with whom we communicated. Strangely, Professor Hooks seems to imagine our engagement with scholars through one possibility and one possibility only: that we sought out advice and did not take it. This is completely false. Professor Hooks obviously knows that not all early modern scholars agree, even when it comes to paleography. Professor Hooks asserts the chief reason for writing his essay is because “ignoring amateur enthusiasts and conspiratorial eccentrics does not mean that their theories go away — in fact they are often intensified when Shakespeare scholars refuse to engage with them.” Professor Hooks makes it abundantly clear that he feels the backdrop to the Beehive story pits a pair of booksellers (at best “amateur enthusiasts,” at worst “conspiratorial eccentrics”) vs. “generous and congenial scholars.” Such a simple-minded assessment damages any effort at encouraging further inquiry either from fellow scholars or curious members of the public. Equally problematic is how Professor Hooks diminishes and distorts our arguments as he progresses through his own analysis. His analysis contains a number of errors and inaccurate assumptions. Just as Professor Hooks expressed it unnecessary to respond to all of what is in our book (“once the flaws in a particular methodology are identified, and crucial details have been assessed as inaccurate or misleading, it is not productive to continue”), neither will we respond to all of his review, as we feel once we have established problems with his method at some point it no longer serves any purpose. Using a rhetorical strategy that runs throughout, Professor Hooks writes: “my intention here is to take the arguments presented in the book seriously.” It is implicit here and elsewhere that Professor Hooks feels we don’t really deserve to be taken seriously, thus shaping the narrative for his readers much as he claims we do in ours. Less than ten days before posting his essay, Professor Hooks politely requested a document, a supplement to Shakespeare’s Beehive, which we offer through our website. A PDF of over 450 pages, it includes a compilation of every annotation in our Alvearie. The PDF also contains connective texts to assist those who wish to study the annotations in greater detail. The terms “spoken” annotations and “mute” annotations are clearly explained. These terms were first coined and introduced in Shakespeare’s Beehive, both to distinguish between the types of annotations, and to help demonstrate the integrated manner in which they are used. How they are connected and intertwined is an essential aspect in terms of approaching both the methodology of the annotator and the paleography. When the annotator has supplied a word, or a sequence of words, we refer to these annotations as spoken annotations. These are complimented by what we call the mute annotations, annotations that do not involve the additions of words, but repetitive marks instead. The three primary means by which the annotator has consistently marked the printed text without adding a word are: slash marks alongside headwords, little circles alongside subsidiary definitions, and underlining to text sequences or individual words within the printed text. There are thousands of mute annotations used by the annotator throughout the dictionary with consistency and purpose. In his essay Professor Hooks makes no mention of the terms “spoken” and “mute”. He simply ignores them. The spoken annotations are almost entirely derived from the printed dictionary text (as the compilation shared with Professor Hooks demonstrates with every example coded). A mute annotation (usually an underlining) can almost always be found at the textual position in Baret where from the spoken annotation has been grabbed, before its re-position alphabetically at another place in the dictionary. Professor Hooks had access to both Shakespeare’s Beehive and the supplement, so there is no excuse for ignoring details we stress in both, and repeatedly insisting that we have overlooked something as basic as an alphabetical insertion formulated from the dictionary text as outlined above, or the recording of a French annotation. If “the details still matter,” as Professor Hooks insists, why not share them? Why distort them? Why take false credit for them? Repeatedly, Professor Hooks does all of these things. In his own investigation, Professor Hooks writes: “Koppelman and Wechsler reiterate their dependence on Baldwin multiple times.” “Dependence” is extremely misleading and in fact spurious. The fact that Baldwin’s statement expresses a necessary condition for our assertion to be valid does not mean we are dependent on Baldwin’s writing itself as necessary evidence to that effect. We are not. Nor did we accept the idea of Baldwin being correct at face value. But Professor Hooks’ statement is, once again, inaccurate. Not one, not two, but three examples under abandon, where the connection to the “vulgar leave” is linked, are annotated. To repeat, we shared this document with Professor Hooks, and he has access to the digital facsimile of our Alvearie online (his essay includes images from it). ο To abandon: to leave, or forsake. ο He which leaveth, abandoneth or forsaketh. ο A leavying, abandoning or forsaking. Acknowledging the annotations in our copy at this entry is far less important than highlighting the fact that Professor Hooks tells his readers that there are none there. And the inference that Professor Hooks makes for why we don’t share this example (he says it is because there are no annotations there, when in fact there are) is also untrue. We were aware of T. W. Baldwin’s example, we were aware of the annotations, and we were also aware that it is the only time in Shakespeare that forms of the words “leave” and “abandon” are combined in a speech. In fact, we have it recorded among the many hundreds of stored supplementary examples not included in either edition of Shakespeare’s Beehive. But we chose not to include it among the evidence because we felt that there were much stronger examples to illustrate how our annotator was working, and the recurring patterns that are found in Shakespeare. Professor Hooks concludes the Baldwin portion of his essay by saying: “In the only instance their scholarly authority could find of a potentially direct connection between Baret and Shakespeare, the book fails to live up to its billing.” Not only is this overly dramatic rhetoric, it is inaccurate, as we have just shown. Furthermore, and just as importantly, the implication that we are reliant on a single scholarly authority in showing potentially direct connections between Baret and Shakespeare is also completely wrong. We address a number of “potentially direct connections between Baret and Shakespeare” that a variety of scholarly authorities have made (necessarily leaving out many others due to space), dating back to the 18th century when critical editions of Shakespeare’s work first appeared. Enrings the barky fingers of the Elme. O how I loue thee! how I dote on thee! Both mentions of woodbine in our Alvearie receive attention from the annotator. H582. / Honiesuckle herbe. Vide woodbine. This is just one of a great number of occasions where scholars have turned to Baret for linguistic clarification. Potentially direct connections between Baret and Shakespeare extend over centuries to the present day, hardly by way of any single scholarly authority. Printed texts that are unique to Baret include the introductions, or preambles, to letters. These odd contributions to letter reform are short essays on letters and pronunciation that precede the entries under each given letter. In one of them, the preamble to Letter E, Patricia Parker, a professor of English at Stanford, notes (without citing the location) that portions of the text “sound uncannily like Hamlet’s instructions to the players.” The same bits of text in question, sounding uncannily like Hamlet’s instructions to the players to Professor Parker, have been worked over in our copy, first with mute and then with spoken annotations. This is the probable order the annotator works from throughout. Mute annotations precede spoken annotations. The annotations marked in the preamble to Letter E and taken from there did less to enliven our belief that Shakespeare was the annotator, than they did to inspire us to find more examples of potentially direct connections. Why not add to existing scholarship? The underlining of the word “ragged” in “ragged hands” is exactly the type of mute annotation that so often leads to alphabetical insertions of text. We see that over and over again throughout the book. It is repeatedly surprising how Professor Hooks ignores the extent to which we have studied Baret in relation to Shakespeare. As we say, already on page 9 of our book, “…to a large extent we went about our business of exploring the nooks and crannies of the text of Baret’s Alvearie as a means of testing Baldwin’s general assessment of it in regard to Shakespeare.” Let us turn to a few examples of what we uncovered. What’s in a single word? Potentially, more than you might think. It would be interesting to know how many other playwrights of the period record usages of the following trio of fishes: cuttle, dace, and gurnet in their work. All three words are marked in our dictionary. Each word appears a single time in Shakespeare, and, curiously, always in and around the same character – Falstaff. The foul-tasting gurnard fish, or gurnet, is referenced (by Falstaff) in 1 Henry IV: “If I be not ashamed of my soldiers, I am a soused gurnet.” The entry for the little species of minnow, the dace, is the first entry under letter D. Falstaff ends the third act in 2 Henry IV with a reference: “If the young dace be a bait for the old pike.” Our annotator has marked dace with a slash, just as he has the final entry (also a fish, oddly enough) under letter C, cuttle. And Shakespeare’s only recorded use of cuttle appears in the final scene of the preceding act in the same play, directed at Falstaff and his gang of rascals (Pistol specifically) by Doll Tearsheet: “By this wine, I’ll thrust my knife in your mouldy chaps, an you play the saucy cuttle with me.” It’s an example from the proliferation of double-entendres we find in Shakespeare – the perfect choice for that moment. It can be no accident that a cuttle is a knife used by pickpockets to cut the bottom of purses, and is also a fish known to excrete from its mouth a foul inky juice. I’ll cut you, if you play the foul-mouthed bully with me, implies Doll. Any number of examples could be chosen from our Baret to similar effect. We hope that this cluster surrounding little fish and foul fishes has provided a small demonstration of how our annotator worked and what we find in Shakespeare. We share similar and more complex examples involving clusters of words over and over again in Shakespeare’s Beehive. Instead of addressing our principal argument in any detail, Professor Hooks pecks away at the periphery. Any argument for these being simple words of little consequence collapses under the awareness that both keep and chest and robe and chest are combined in Shakespeare only in Sonnet 52. Such textual observation charmingly reinforces the pattern we attempt to make a case for throughout, but this is only a small part of what makes the annotation “yeoman vide warderrobe” such an appealing example. The neighboring alphabetic word to the annotation “yeoman vide warderobbe” is yellow, and this word lands directly and symbolically in the scene where Malvolio speaks the phrase, “yeoman of the wardrobe” when he reads Maria’s letter (mistaking the handwriting as Olivia’s) that requests for him to appear (forever to the delight of audiences) in yellow stockings. The annotator’s entering “yeoman vide warderobbe” alongside Baret’s printed entry for yellow matches the mind of an author who has a character utter “yeoman of the wardrobe” while knowing (before anyone else does) that this very character, his creation, will soon be wearing yellow. It would be one thing if Shakespeare used yeoman and wardrobe together on a regular basis under varying circumstances. But he does not. The one and only time Shakespeare has a character use these words together it immediately sets in motion the brightest, most repetitive, and most memorable presence of yellow to appear anywhere in the canon (9 of 29 usages). If the annotation simply read “yeoman” we could be looking at an alphabetical insertion and nothing more; but the presence of the word “wardrobe” changes things. An interpretation of the entire annotation as simply an alphabetical insertion with a Shakespearean textual coincidence is, we feel, a suspect conclusion, given the sum of synchronistic occurrences we uncover in our Alvearie. Let us look at one more example, this one spawned by the observation of Rene Weis (professor at University College of London), when he referenced the following stanza at the beginning of Venus and Adonis. He winks, and turnes his lips another way. Venus and Adonis contains Shakespeare’s only uses of the dive-dapper or didapper bird, something that we already knew before reading Weis. We were also aware of how enamored our annotator seemed to be with the shy little bird. Over several distinct entries (alternate spellings) he expresses repeated interest, marking the text and adding to it. After reading Weis, we returned to the annotations. At one location we observed how the printed text matches Shakespeare’s recollection. The annotator marks the subsidiary definition at D994 with a little circle, just below the use of a slash mark at a Diuer, or Didapper bird. In between these two entries he adds “dowker” and “dobchicke” – two variations on the dive-dapper name – with lines connecting them to the words: to diue, or ducke under the water. But then we noticed something else – the underlining of a proverb (an English translation from Plutarch) that completes Baret’s entry at D994. The key underlined word in our copy that just so happens to appear at the start of the stanza at the moment when the divedapper makes its sole Shakespearean appearance is promise. This word is ushered forth in the Baret text by the Latin that precedes it, diues promissis. The word promise is then repeated not once, but twice under the proverb that follows. There are roughly 10,000 words, 1,200 lines, and 200 stanzas in Venus and Adonis, and the word promise appears in any form only once – resting directly in the line above the word divedapper. We do not believe that the word promise, with its peculiar and irrefutable connection to the divedapper entry in Baret’s Alvearie, is an accident, but that personal experience and Shakespeare’s engagement with our copy have come together to produce a dazzling moment of poetry. In a series of exchanges between the annotator and the Baret text – an exchange that involves spoken and all three primary mute annotation types – the stanza from Venus and Adonis is illuminated like never before. Professor Hooks declines to share any of the more enticing examples from Shakespeare’s Beehive. Instead, he oversimplifies and distorts our arguments, using reductive language. He does this throughout, including when he discusses the biblical annotations. There are twelve biblical citations that the annotator has mixed among his annotations over time as he explored language, seven of these are from the Psalms and five others fall outside the Psalms but are found in the Book of Common Prayer. We note the different Bible translations of the period and how each of the twelve citations follows wording from the Great Bible. It is apparent that the annotator is working from memory, as the citations are not exact matches to either the wording or the spelling in a printed text, and two annotations have citation numbering that is incorrect. Therefore it is clear that there was no printed bible consulted at the moment the annotator reached into his memory. Professor Hooks agrees with elements of our biblical annotation study, although you can tell it pains him to admit as much: “It is possible,” he writes “and likely, that one particular reader made this particular kind of connection between the Psalms and some of the terms listed in the dictionary.” He fails to point out that the annotator is often making Biblical connections with terms that are not listed in the dictionary, such as Areed (Mark 14). Professor Hooks acknowledges “the claim that Shakespeare imitated the phrasing of the Psalms from the Great Bible — when he quoted the Psalms — is absolutely correct,” but feels that it does not help us in any way to date the annotations. We disagree. We feel it is part of the evidence. Our annotator is working from memory, not from a printed text. Furthermore, our dating sense comes from multiple factors including the unlikelihood of a later annotator using the dictionary by this particular method when there would have been more up-to-date dictionaries in use. Finally, nothing in our biblical annotations dismisses an earlier dating, as a citation belonging first to the King James Bible would have. Professor Hooks requested and was given a meticulously organized document that includes each of the spoken annotations (as well as all the mute annotations) in our Alvearie. The document also demonstrates how the annotations are related to the printed text, so it is odd that he does not acknowledge the uniqueness of the biblical set of annotations among the whole. The biblical memories are obviously outside the box when it comes to the annotator’s regularized methods for alphabetically entering words or phrases of text he has pulled directly from his Alvearie. The other annotation we identify as biblical in spite of not being marked as such is “Drought in Sommer”. Professor Hooks acknowledges the line we provide from Titus Andronicus beginning “In summers drought” and begrudgingly admits, “granted, this is not the same as ‘Drought In Sommer,’ but it might be considered a parallel.” But he neglects to share the really remarkable Shakespearean use of Psalm 32 echoing in Titus Andronicus. On three separate occasions, each time through the mouth of the same character, we find unique Shakespearean parallels to Psalm 32 (discovered when we looked at the full line where “Drought in Sommer” appears, as well as the line preceding it). Professor Hooks cuts our argument short, once again, focusing instead on the trivial fact that we do not mention that the French for “Drought” is also added to the margin by the annotator. Professor Hooks has our PDF, diligently prepared over years of work and shared with him as an extension of congeniality, and is aware that we have recorded every one of the French annotations. That Professor Hooks confuses footnotes with endnotes is easily forgiven, but his misreading of the note to a sentence from an early chapter on paleography (“not much later passage”) is not. Our endnote does cite “instances where a majuscule letter ‘B’ bears some resemblance to the capital ‘B’ as printed in Baret.” But it also makes the vitally important distinction that the “some resemblance” factor is seen in annotations spread throughout the dictionary, as opposed to falling under the letter “B”. As we note in our book, the annotator does not carry an imitation of a majuscule “W” or “S” into an annotation anywhere outside the said letter alone. The imitations are straightforward, and completely outside his variable handwriting. The annotator, in looking directly down at the typeface, occasionally (five times within the letter W, three times within the letter S) makes an imitation of the majuscule letter at the start of the annotation. He does this absolutely nowhere else. Professor Hooks openly admits to not having done “a complete survey of the annotations.” We have done a complete survey, and have little doubt that our conclusion regarding the “W” and “S” will eventually be confirmed by unbiased assessments. Professor Hooks wants to make his point as strongly as possible in spite of not having conducted a complete survey. He writes: “I will say there are other capital letters that seem to imitate the typography in the Alvearie, some of which are capital letters,” but Professor Hooks fails to say which letters these are! This is highly misleading. And the reason he does not point them out is because they are not there. There are no other examples of majuscule letters where the annotator looks down at the typeface and goes on to awkwardly work elements of the typeface into an annotation at that position in his dictionary. We say awkwardly because the attempts with the W and S are not free flowing, as they would be if the annotator were accustomed to writing them that way. The “some resemblance” to the capital letter B as printed in Baret is spread out in annotations over six distinctly different points in the dictionary (under entries for five different letters and the trailing blank where no printed text appears at all). The example on the trailing blank is useful as an example for multiple reasons. We see alternate versions of a capital letter B within a sequence of words added to a page that has no printed text. None of these are imitations of letters that are printed on the page. It is part of the annotator’s customary mixed hand and is entirely free-flowing, unlike the imitations involving the letters W & S.
The “some relation” component specifically is the loop-curve extending from the bottom left of the capital B in “Braque” (bottom word, middle of the image above). This element is in some small measure also part of the capital B as printed in entries under letter B, so we wanted to acknowledge that in our endnote. But another critical point is that the “B” in “Braque” that we see here is a standard letterform found in the paleography of the period (one has to look no further than the “B” in “By me” added to Shakespeare’s own will to see another version of it). The W&S imitations remain completely outside the annotator’s own diverse normal hand, as well as the extraordinarily diverse paleography of the period. The W&S imitations are a direct result of attempting to copy a letter that is printed within immediate direct view. Here are two (“shuffled” and “wedlocke”) examples. As he does elsewhere, Professor Hooks distorts our arguments involving paleography, adds his own interpretation, and claims we have said things that we have not. He writes: “I do not agree with the conclusion that the significant and visible variations in both the handwriting and the ink must point to a single, identifiable annotator.” That is not at all what we say. We have studied each of the thousands of annotations in our Alvearie extremely carefully. The effort is so coordinated, the integration between the spoken and mute annotations so distinctive, and the variability in the hand so repetitive even in its diversity that we find that the evidence allowing us to speak of a single annotator is overwhelming, but not for the reason Professor Hooks gives. Professor Hooks writes: “the varied color of the ink also seems to indicate that a reader (perhaps even more than one) returned to this activity again and again. In no way shape or form does one reader returning over time run counter to the argument within the book. We say explicitly that the annotator has returned over and over again to this activity. It is misleading that Professor Hooks leaves this out, just as he has so much other relevant information. This understanding is written in right from the very start of our book: “Of significant importance, after a number of readings, one could see that the markings – whether added words or symbols – were part of a characteristic method and were continually interrelated, and the whole was suggestive of a single annotator at work over an indeterminate but clearly substantial amount of time.” Ink variability could even be a product of one day to the next, as ink was not standardized. Eventually ink ran out, and you used a different batch. As for the exact time period over which our book was annotated, we readily admit we will never know. Without being able to prove that the annotations occurred over many decades there is nothing relevant about Professor Hooks’ point here, but unless you’ve actually read our book it would seem otherwise. 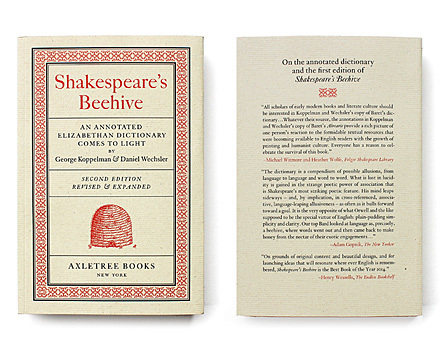 For Professor Hooks, the engagement with Shakespeare’s Beehive began shortly after our first edition was released. He was kind enough to write, “It is a very fine book indeed, one that was clearly produced by people who love and appreciate fine books.” But then he follows up this praise by saying that “it is also designed to make money, both directly and indirectly,” and so begins his theme, conveyed in his first essay, and emphasized much more strongly in his recent piece addressing our second edition, that we are in this chiefly for the money. He even has a section labeled “Money,” as if that bears important consideration in regard to the evidence. Let’s be perfectly clear: if you have designs on making money as a rare bookseller you would be wise not to make a case for having found Shakespeare’s personally annotated dictionary. If you intend to write, self-publish, and self-distribute fine press books to promote your thesis, you will most likely lose a lot of money. If you are lucky, you will defray some small percentage of your expenses through the selling of your self-published and self-distributed books. We understood all of this from the beginning, but took the risk because we firmly believed, and still believe, that our conclusion is correct. We cannot deny that we are rare booksellers. That means part of what we do is look to find books and buy them for one price, and attempt to sell them for a bigger price. But our motivations here are far more complex, as are the strategies. Professor Hooks takes our desire “to find a more suitable home” and twists it to mean hoping to sell the dictionary for a lot of money to someone, or some institution, gullible enough to be persuaded by our argument. That is not our intention. We may not be able to change Professor Hooks’ mind in regard to what has motivated us. But surely he and his colleagues will agree that scholars also have books to sell, and tenure to land, and peers to impress, and are very often motivated in their own right. Nothing is more suspect than to claim to have no agenda whatsoever. Professor Hooks’ own work displays an open distrust of any inkling of biographical interpretation – what he refers to as the “myths and legends” surrounding Shakespeare. So one can imagine his concern when a 16th century annotated dictionary turned up that at various moments may well contain veiled references to a number of the most prominent biographical speculations involving Shakespeare. Yet Professor Hooks questions our finding reflection in the annotations in “a variety of myths and legends surrounding Shakespeare’s earliest years in London,” even as we cite numerous scholarly sources, and bemoans that we are caught up in the biographical speculations at all. To note one speculation he does not mention, Professor Hooks may well cringe at the thought of feeling strongly that Shakespeare was once referenced as “William Shakeshafte,” so it’s possible he’s rather annoyed at the “coincidence” (his likely interpretation) of an early modern annotator adding “shaft” to the right of the printed entry for “Shake” along with a connecting slash. Alphabetical? Yes. It’s also almost certainly a unique alphabetical insertion and placement among all surviving copies of Baret’s Alvearie with early modern annotations, and it just happens to fall in our copy. “My conclusion” writes Professor Hooks “is that, based on the evidence presented, Shakespeare cannot be considered as the annotator of this particular dictionary.” But he follows by saying that he’s not willing to say explicitly that this is not Shakespeare’s dictionary, “because that is not how scholarship works.” Such a statement is completely disingenuous and Professor Hooks knows it. Shakespeare scholars make definitive statements all the time – starting with Shakespeare not being the Earl of Oxford. Some scholars have come out with definitive statements regarding our thesis. As others before, Professor Hooks shares Grace Ioppolo’s tweets wherein she felt justified in making a definitive (if also, egregious) statement on the basis of having been granted a preview of a small handful of annotations. A very well respected Shakespearean, Jonathan Bate, whose books we admire, came out quickly (after viewing the digital copy provide on our website) with the statement: “the handwriting certainly isn’t Shakespeare’s.” Jason Scott-Warren, director of the Cambridge Centre for Material Texts, and H. R. Woudhyusen, rector of Lincoln College, also made definitive statements. Interestingly, Professor Hooks did write in his first essay (2014) concerning our assertion: “This annotated copy of John Baret’s Alvearie was not Shakespeare’s beehive.” But then, before publishing his second essay (2016) he altered that sentence before reposting it, to read: “is, in all probability, not Shakespeare’s beehive.” This is a curious edit – one that suggests Professor Hooks may have some doubts after all. Where Professor Hooks seems to have no doubt at all is in the condemnation of our approach. “The first thing I tell my students,” he writes, “is to Stop Thinking & Start Working — that is, work through the material first, and let an argument emerge from that work. Starting with a predetermined argument means that you are in danger of simply finding what you already wanted to find.” This is extraordinarily reductive and refers to students given a task essentially to make some kind of basic academic response to a written text. If Professor Hooks is at the Folger Shakespeare Library and is researching an old book and he sees a line in the margins that has a Shakespearean ring to it and he wants to investigate it further, he shouldn’t be allowed to because he’s had that thought and therefore his inquiry will be irrevocably tainted? We are of the opinion that you have to have the idea somewhere/sometime. There is no fundamental flaw in attempting to prove a hypothesis – or leap of intuition for that matter. To ask what if is an essential part of reasoning and discovery. To hear Professor Hooks say it, you must have your idea after you’ve found incontrovertible evidence without even knowing what you’re looking for. This is a very narrow kind of scholarship. And very pedantic. But in the end we are convinced that the annotations have everything to do with Shakespeare. We believe Shakespeare is the annotator. Certainly it is not an annotator, or a group of annotators, attempting to make it look as though Shakespeare is the annotator. It is also clearly not someone actively working from quarto and folio texts of Shakespeare, as Grace Ioppolo erroneously claimed to have told us, and absurdly concluded in her announcement on Twitter. That a language lover could, through coincidence and shared language alone, stumble on so much strikes us as too improbable, but we are eager, not afraid, to see this tested by other means. We can only hope that the work we have done can be enjoyed, and tested and treated more honestly than in the misrepresentative examination of our argument presented by Professor Adam Hooks. 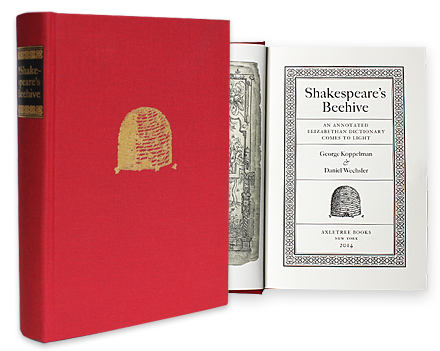 And on one final note, anyone who wishes to review Shakespeare’s Beehive for publication, just let us know – we will send you a complimentary copy of the second edition. Holiday Greetings / What’s In a Name?